NES Donkey Kong Jr. (JPN/USA) in 01:12.81 by Aglar, Aqfaq & Ferret Warlord. A very important part of Nintendo's history is being presented here on our website — as a tool-assisted speedrun. Donkey Kong Jr., along with Donkey Kong, were classic games that were played by millions of players on various consoles, including the NES, Atari 2600 and Game and Watch. The story is that Jumpman, now known as Mario, has captured his rival Donkey Kong and it's up to Junior to save his dad. Although one would not expect a movie of Donkey Kong Jr. to be interesting to watch, except in the retro sense, this movie is actually quite surprising. 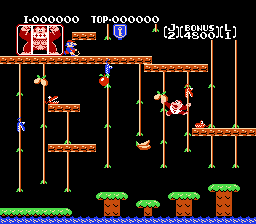 The vines are cleverly utilized to move the hero forward faster than any member of the Kong family before or after this game. This is a 1 frame optimization of Level 4 compared to the previous movie.